me and every1 else only!!! no kobe. we will nevr move 2 current. those who leave there home village 4 somthing as stupid as regen r bastards and should nevr come bak 2 konoki. but mayb i'll make a new generation of konoki riaders. oooo fine then.I won't make a squad in current.I'll make it in the second most regen getting village.the only problem is that I don't no which village that is lol. Btw who's bigmac sensei? rare >_> I am here all the time but i just dont feel like posting.Whats with the nasty face>_>. Basically its better for a vilage when people leave >_> the less people the less village funds they need and konoki was pretty much done for since the beginning with there 15k+ villagers.Current on the other has now almost 2 the regen a lycantroph bloodline has. ya it is. i wonder y he hasn't posted here. lol. kobe, watch goerge lopez or something. get real comedy skills. 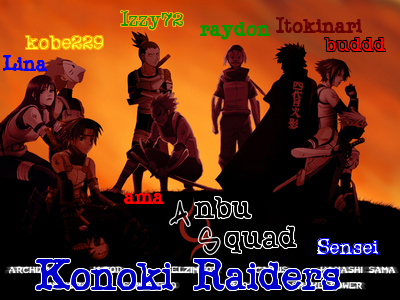 People only join konoki be cause it is spelled almost the same as Konoha. We need admin and he has to have this option called the sh*t dumper and take all the never go ons because im to lazy tos to other villages so we are not the dumpster any more and make silence the dumpster and they will smell funneh!!!!! kobe... how can i say this... UR NOT FUNNY!!! WAT! SENSEI JUST GOT SSSSERRRVEEEDDDDDD! wait... i'm sensei. omg!!! Subject: Re: me and every1 else only!! !